MTSU closes Jan. 21 for MLK ho..
MTSU’s Baum sworn in to Genera.. 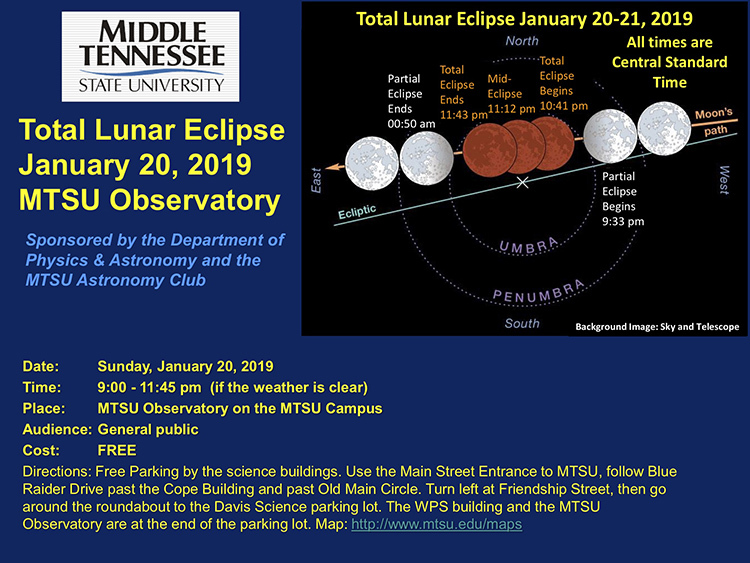 Weather permitting, the MTSU Department of Physics and Astronomy and the MTSU Astronomy Club will welcome the public this Sunday, Jan. 20, to watch the total lunar eclipse at the university’s observatory on campus. Visitors are welcome from 9 to 11:45 p.m. Sunday if the weather is clear, said Dr. Chuck Higgins, associate professor of astronomy at MTSU. He added that no formal talk or program is planned, only observation of the lunar event. Current forecasts call for temperatures in the low 20s Sunday night with some gusty winds and clouds. A partial eclipse will begin at 9:33 p.m. Central. The total eclipse begins at 10:41 p.m. and ends at 11:43. A second partial eclipse ends at 12:50 a.m. NASA is estimating the duration of the Jan. 20 eclipse at one hour and two minutes and says totality will be visible from North and South America, Europe and western Africa. This will be the only total lunar eclipse of 2019; the next is expected in May 2021. NASA is calling the Jan. 20 eclipse a “super blood moon” because of of the full moon’s proximity to Earth and the resulting reddish hue from the eclipse. According to the Department of Physics and Astronomy, this particular eclipse is also sometimes referred to as a “super blood wolf moon.” Native American tribes in what’s now the northern and eastern United States called the January full moon phase the “wolf moon” because the hungry animals howled during the winter full moon, which coincides with the start of their breeding season. The site continues: “The moon can also look reddish because Earth’s atmosphere absorbs the other colors while it bends some sunlight toward the moon. Sunlight bending through the atmosphere and absorbing other colors is also why sunsets are orange and red. The MTSU observatory is located on Old Main Circle, next to Wiser-Patten Science Hall and near the Cope Administration Building. A campus map is available at http://tinyurl.com/MTParkingMap. MTSU’s Department of Physics and Astronomy conducts regular “Star Parties” for the public on the first Fridays of months during the spring and fall semesters and for special astronomical events like eclipses. The first “Star Party” for spring 2019 is set for Friday, Feb. 1, with more details to be announced. For more information, call 615-898-2130 or visit www.mtsu.edu/observatory/star_parties.php. Click the image to view a full-sized version.